If you're like me you eat, breathe and sleep PI. 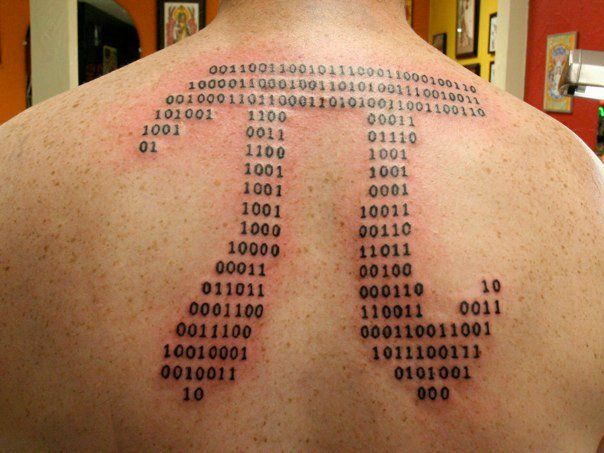 This of course means we see PI whereever we go. A friend of mine is currently studying in Toronto. When she showed me this picture she took, guess what came to my mind?! Maybe not 100% on topic, but this image from wikipedia blew my mind the first time I saw it. I use this to explain the meaning of the PI constant to people who are not familiair with it. And while in Spain, do as the spanish? I think the real question is: Why where you making pictures of some cleaning product while on holiday? Not quite the same visual representation of PI as you guys but I often look at shops, healthcare, garages etc and think "you could use PI to do that"...in fact I remember sitting in the hospital at 4am, 13 hours in to my wife's labour watching our baby's heart rate being drawn in ink on graph paper and folded in to a file, some other data around the whole pregnancy being written down every few hours - what was I doing at this point in time, looking at the make/model of the machine collecting the data wondering if there is a PI interface available so I can nip home get my laptop and watch the heartrate in ProcessBook. Needless to say I soon decided that I needed to relax more and work less. I also always wanted to connect a PI System to the computer of my Toyota Prius, so I can get the trip data and use some PE's and AF to calculate neat stuff. I think my biggest bug these days is Event Frames - I see them everywhere!! I would want to create Event Frames for pretty much anything and compare events (and the data that Rhys collected) with each other... As one of my friends used to say: "Life's a batch". That was back in the old days... today, one would say everything's an Event Frames and has sub-events and sub-sub-events. We did that here in Montreal: we developed some PI Car Interface, using the OBD-II port under the steering wheel, and a little device called ElmScan, to convert OBD stuff to RS232 (serial port). Nice! Also for a Toyota Prius? I was looking into the ODB-II interface and the elmScan. Is there any data/whitepaper/documentation available about that project? Also for a Toyota Prius? I was looking into the ODB-II interface and the elmScan. Is there any data/whitepaper/documentation available about that project? About our own project? Not really... About OBD-II and the elmScan, you can look at the www.scantool.net and www.obdscan.net websites). I also have a few other PDF files as references... just let me know if you get going with this and I could zip them up and send them your way. I also have a few other PDF files as references... just let me know if you get going with this and I could zip them up and send them your way. Thanks! I will give you an email if I get around to it! Thanks Borre this is great! It's getting interesting! Do we know how PI sounds like? Wow this is really amazing and tough to beat (and geeky ) thanks Asle! Looks like the only one left is to figure out how PI "feels"! @Asle: what did PI mean in the context of that menu? Nice one Michael. Actually, as vCampus Live is in Movember (formally known as November) we should all grow our moustaches for the event and give that picture another meaning! Rhys @ WiproNice one Michael. Actually, as vCampus Live is in Movember (formally known as November) we should all grow our moustaches for the event and give that picture another meaning! Lol, let's do that Not sure our spouses will agree though... I already have somewhat of a beard, so all I have to do is shave off everything but the moustache. I think I have been a member of VCampus for 3 years now, and have not been to one VCampus Live ! Nice, this is yet another interpretation. Sounds pretty soothing Thanks for sharing Wolfgang! OK, I have been waiting a long time to post to this thread. I finally found my PI photo about 80 miles on a dirt road outside of Death Valley. The temperature was 115 def F when I stepped out to take the photo. lol Thanks for taking that photo! @Michael, while the PI as a tip is a cute application, the wait person won't think its so cute. The customary U.S. food service tip is between 15% and 20% of the pre-tax meal. Assuming a tax rate of 9%, which is higher than average, then a base bill of $26.86 would have the pre-tax meal of $24.64 with the tax of $2.22. Therefore, a tip of $3.14 of the $24.64 results in a meager 12.74% tip. Just sayin'. I wonder if this will feature any action ("Corrupt archives", "PI-server down!") or if it is more of a romance flick ("You had me at sinusoid"). Yes, we are all waiting for it! I would just like to say that if I were a Super Hero, that is the name I would want "Magnum PI"
You going to vCampus Live Ken? Does that make my Super Hero mysterious ?? Below is " Life of PI"
Some of the new people may not know about this tread, it is one of my favorites of all time from the vCampus days. Now get your cameras out and start taking some pictures!! Thanks for bringing this thread back, Lonnie! The only glaring omission from his list is one of the most important πs: the PI System!